ABEL, Barbara - Page 1, Sec 23, Plot 4. Note: West of Waller. ALBERDING, C.H. - Page 6, Sec 23, Plot 169. Notes: Born 1807 Died 16 August 1870 Age 63. Native of Germany. Saloon Keeper. ALDRIDGE, Percy & Lorene. Cremation H3. ALEXANDER, Minnie Alice Couch. Notes: Pg 6, Plot 291. ALLEN, Adeline B. (V.?) Born 21 June 1900 - Died 20 Aug 1937. ALLEN, Betty Notes: A-9. Pg 7, 2005. ALLEN, Weldon - Cremation ED3. ALLISON, Elwood - Page 2, Sec 80, Plot 2. ALLISON, Ethel - Page 2, Sec 80, Plot 1. 1897 - 1965 Note: W of Hamilton. ALLISON, Tempee - Page 2, Sec 80, Plot Between 1 & 2. 1891 - 19?? AMOS, Vivian Page 5, Plot 60, Sp 4. ARENA, Susan Page 5, Sect. 348 Note: In with ORR, Owen & Effie. ARCHIBALD, Elbert Page 5, Sect. 123 Note: Open space and unknown filled space. ARGUELLO, Susan Page 5, Plot 243. 1920-1989. ARMSTRONG, Ann Page 1, Sect 43, Plot 2. 5 August 1916 - 4 May 1985. AROZ, Magilda Page 5, Plot 201. Note: Martin Aroz - Vivian Queirolo. AROZ, Martin Page 5, Sec. 200. 1908-1978 Note: End of Section - Magilda Aroz. ASBRA, Kathryn Page 7 A-13. 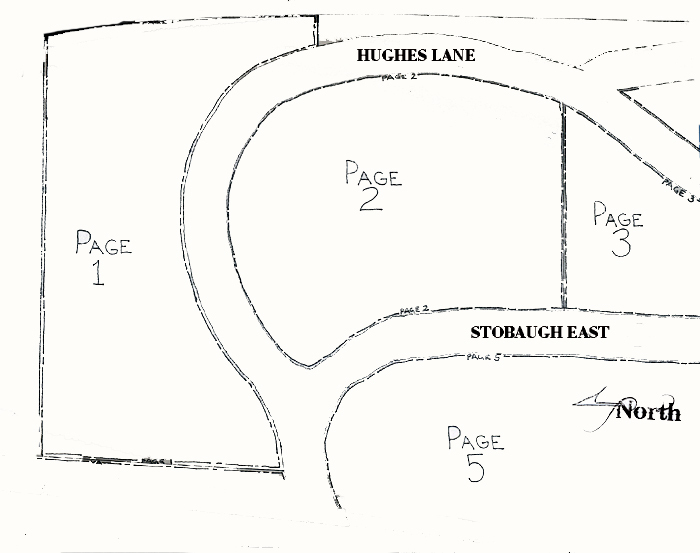 ASBURY, Ruth (Red) Page 5, Plot 249 1901-1994. ASHER, Kevin Page 1, Plot 16 Sp 3 Note: AKA Sadden Plot. ASHER, Kelly (Shadden) Page 1, Plot 16 Sp 4 Note: AKA Sadden Plot. ASHER, ? Page 1, Plot 16 Sp 2 Note: AKA Sadden Plot. ASHER, ? Page 1, Plot 16 Sp 1 Note: AKA Sadden Plot. 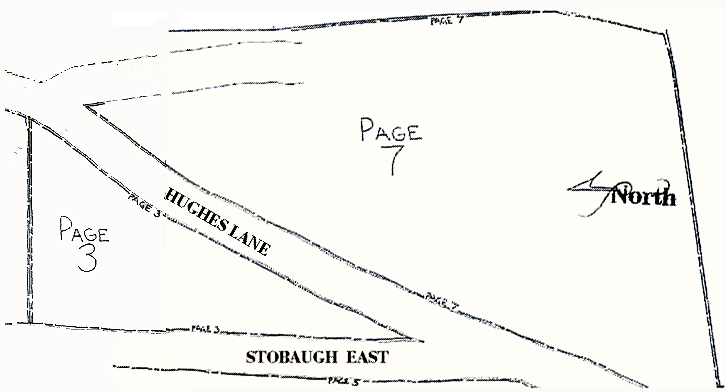 AUTOHOUSE, John H. - Page 2, Plot 1, Sp 63. 1888-1973 Note: East of Honiker. AZEVEDO, John - Page 1, Sec 4, Plot 22. Note: with father. AZEVEDO, Nina MG - Page 1, Sec 24, Plot 1. 1917 - ? Note: West of Whitman. AZEVEDO, Joseph Francis - Page 1, Sec 24, Plot 2. Note: West of Whitman. Was a machinist, married to Nina Thoelecke. His parents were John P. Azevedo of California & Mary Oliveira of Hawaii (see IOOF plots). Died of cancer. AZEVEDO, Raymon & Kathleen - Page 1, Sp 3 & 4, Plot 22. E. G. B. - Page 6, Plot 87 Note: Scribed 6"x6" footstone only. BACICALUPI, Antonia - Page 6, Plot 284. Died 19 January 1918. BACIGALUPI, Chester & Barbara - Page 1, Plot 28 Sp 24. BACIGALUPI, Joseph A. - Page 5, #37. Born in Calif 1 Oct 1883 - Died 9 Dec 1967 Notes: West of Laughlin, East of Queirolo. He was a car mechanic on Main St Columbia. His parents were Anton Bacigalupi of Italy and Mary Galiardo of Italy. BACIGALOPI, Peter J. - Page 5, #36. Born in Calif. 9 July 1875 - Died 19 Feb 1961 Note: Carpenter. His parents were Anton Bacigalupi of Italy and Marie Galiardo of Italy. Died of a stroke. BAIER, Albert - Page 6, Plot 233. BAIER, Edward A. - Page 6, Plot 17. BAILEY, Hansford Bill - Page 1, Sec. 44, Plot 4. BAKER, Peter - page 7 Note: E 8,9,10,11 . BAKER, Barbara - page 7 Note: E-8 E 8,9,10,11 Family Plot . See FENECA, Barbara Baker. BAKER, Robert & Jeanie - Page 7 Note: E 8,9,10,11 Family Plot. Born in Arkansas 24 Oct 1892 - Died 19 Nov 1961. Note: Veteran WWI. Parents were Thomas Barnes of Ohio & Nevada Stone of Tenn. Died of a heart attack. In front of ROARK, Francis M.
BARNES, Aleen - Page 1, V 10. BASYE, Betty & Marvin. - Note: with ROUNDTREE, William & Luella, left side facing east. BASYE, George W. - Page 1, Sec 1, Plot 4. 22 Jan 1895 - 2 April 1984. Note: NW corner. BECK, Gary - Page 5, Sec 76. Note: NOBLE & Gary Beck. BECK, Rufus - Page 5, Sec 139. Born in Minnesota 5 March 1882 - Died 29 Aug 1965 Note: Prospector. Parents were Mike Beck of Norway & Karen Hungenholdt of Norway. Died of heart failure. Victor Schott & James Pool. BECKER, Paul - Page 2, Sec 60, Plot 4. 1915-1979 Note: East of Messer. BELL, Richard Jr. - Page 5, Sec 53. Note: Bell & Laughlin. BENNETT, Norvin Bruce - Page 5, Sec 3. Born in Calif 1 Aug 1904 - Died 2 June 1959 Note: married to Julia Bennett. Hwy Construction worker. Parents were John Bennett of Canada & Elizabeth Burke of Virginia. Died of a heart attack. BENSHOTER, Travis Ned - Page 2, Sec 77, Plot 4. b1909 - d1974 Note: East of Hawkins. BENTZ, Louis - Chinese Section. BERESFORD, George & Marion - Page 5, Between 289 & 290. BERG, June - Page 5, #38 & 39. Note: Berg & Adele Kessler. BERNARD, ? - Page 6, Plot 229. BERTOIA, Everett, Irene - Chinese Section 9C. BESCE, John - Page 2, Sec. 52, Plot 3. BICKEL, Martin - Page 6, Plot 18 b 15 Apr 1827 - d 9 Apr 1863 age 35 Notes: native of Germany, Miner. BICKNEL, Raymond B. - Page 5, Sec 356. 1883 - 1952 Note: Bicknell, Anita - Bicknell, Raymond B. NOTE; permission to be buried there; Susan Michelle Binn, Connie Marie Abbott, Mary Ann Binn & Michael Nelson Binn. Note; Permission to be buried there; Douglas Jerome Bixler, Tessey Lee Bertoia Bixler, Richard J. Hoppe & Melody L. Bixler Hoppe. BIXLER, Douglas Jerome - Chinese Section - Row 9, Space C. Cremains. NOTE: Buried with Everett & Irene Bertoia. Born in Russia c1863 - Died 8 July 1940 Note: Prospector. BOMMER, Catherine - b1800-1865 Page 6, Hart Tambs, Plot 119. BOONE, Betty - Page 1, Plot 25, Sp. A4. Note; East of Foster, South of Foust. BOONE, Jerry - Page 1, Plot 25, Sp. A3. Note; East of Foster, South of Foust. BOONE, Jerry Jr. & Susan - Page 1, South of #46 9x10 space. BOONE - 3 spaces, Page 1, South of #39 East of #46. BOONE, Tan - Page 1, South of #39 1904-1999. BOONE, Alice - Page 1, South of #39 1904- 24 Sept 2007. BOONE, Janice - Page 1, South of plot #24 & hill east of Hudson. BORDEN, James - Page 5, Sec.68. Note: empty & Peter Weber. BORGES, Anthony - Page 1, Sec. 5, Plot 3 Note: West of PIERCE. BOSOVICH, Luke - Page 6, Plot 283 1847 - 2 March 1909 Note: Native of Austria. BOWLING, Jim & Kay - Page 1, V15. BOYD, Bobby, Jeanette & Greg - East Section E 3,4,5 Note: 3-Bobby, 4-Jeannette, 5-Greg. BOYD, Wiliam - Page 5, Sec. 136. Born in Wisconsin 1 Mar 1874 - Died 31 July 1942 Note: Laborer. BRADY, M.J. - Page 2, Sec. 49, Plot 2. BRAGER, Francis Josephine - Page 5, #370. BRAINARD, Benjamin Marcellus - Page 6 Hart Tambs, Plot 83. Born 27 October 1825 - Died 29 June 1856. BRAINARD, Mary Evelyn Landers(married name) - Page 6 Hart Tambs, Plot 83. Born 1832 - Died 18 Aug 1857. BRAINARD, Rueben - Page 6 Hart Tambs, Plot 83. BRIDGES, Calvin - Page 6, Plot 8. b1814 - d21 May 1873 Note: Native of Holliston, Mass. BROWN, Arthur - Page 1, Sp 4, Plot 96. Notes: Native of Maryland. Merchant. 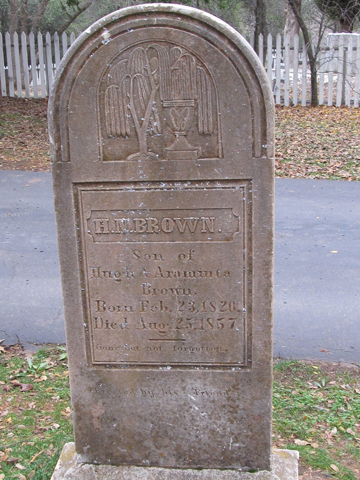 (Mr. Brown's grave is the first one on the right side of the road, just inside the gate. BROWN, Lee L. - Page 5, Sec 220. Born in Kansas 7 March 1892 - Died 26 June 1944 of Consumption (TB) A Carpenter married to Effie Brown. BROWN, Thomas - Page 6, Plot 285. 1855 - 25 Feb 1908 Note: Native of England. BRYAN, Charles Mathew - Page 5, Sec 141. Born in Ohio 16 Sept 1885 - Died 23 Oct 1959. A Miner. Parents were Thomas Bryan of Ireland & Ida Bishop of Ohio. Stroke. Note: James Pool and Engvald Esaksen. BUCKLER, Robert & Audley - Page 1, Sp 2, lot 2. BUKOVICH, Irma - Chinese Sec D9. Born 31 December 1907 - Died 26 December 1996 Note; Roger Privett Cremains Intured with his mother. BURGER, Jane P. & Carl H.J. - Page 5, sec 322 Note: Reid, Austin - Burger, Jane P. & Carl H.J. BURGESS - Page 6, Plot 126 died 14 Dec 1938, age 73. Born in Kansas 21 Aug 1882 - Died 2 Oct 1961 Contruction engineer. Wife was Ella. Born in Germany 1 July 1873 - Died 9 Aug 1960 rancher. Parents were Fred Busse of Germany & Emma Justen of Pennsylvania. Arterio Sclerosis. Note: Andrew Chidester - Katherine Wetmore. CAMPBELL, Edna - Page 5, sec 78 Born 28 Sept 1909 - Died 23 May 1976 Note: Gary Beck & Randolf Campbell. Born in Oregon 11 Feb 1909 - Died 14 June 1969 Truck driver, Married to Edna Campbell. Parents were Ed Campbell of Oregon & Anna Burns of Calif. Heart attack. Note: West of GREIER. Born in Oregon 29 May 1938 - Died 4 Nov 1959 Wife to Sharon Campbell. Parents Randolph Campbell of Oregon & Edna Faucett of Montana. Died when his cabin burned at age 21. CARGILL, Janis Page 2; Section 90. CARNE, Ernest - Page 2, # 2 7 Feb 2000. CARNE, Nadine - Page 2, # 1 Sept 2011. CARPO, Rhoda - Page 1, Sec 23, Plot 2 Note: West of Azevedo. Born in Michigan 18 Aug 1899 - Died 9 Jan 1972 Accountant. Wife was Rhoda Rose Carpo. Parents were Gottlieb Carpo of Germany & Emma Heyer of Germany. Heart attack. Note: West of Walker. CARRIGAN, Chas. - Page 5, Sec 66.2 Note: Charles Copson & Unknown. CARRINGTON, Larry & Susan - Page 3, #117A Note: by Ted Mellor. Born in Italy March 1872 - Died 6 April 1935 Quartz miner. Parents were Stephano Casanova & katherina of Italy. Heart. CASEY, Jerry - Cremation EC3. CASEY, Joanne - Cremation EC2. CARTER, Josephine H. - Page 6, Plot 230. 1823-1898 Age 75. Note: Native of New York. Died of pneumonia. CELLI, Virginia - Page 2, Sec 92, Plot 1. Ashes. 12/08 Note: Buried with parents Bhend, Theodore. CHAMBERS, James C. - Page 6 (Veterans), Sec 12. 1906-1963 Note: In front of Fred EWP Plummer. Born 9 Feb 1868 - Died 5 Aug 1946 Married to Warren Chapman. Parents were Charles Hawke of Ohio & Susan Hoady of Virginia. Cerebral hemorage. Note: Morris, Charles E. Jorda - Chapman, Alice E.
CHIERICI, Jeannette & George - Page 5, Plot 261 Note: in Ruth Dondero Plot. CHILDRESS, Annie Blanche - Page 2, Sec 85, Plot 1. Born in Calif. 13 Jan 1894 - Died 17 March 1971 Housewife. Parents Louis Kress and Miss Holaand. Toxemia. Born in Virginia 19 Jan 1876 - Died 22 April 1967 Cattleman. Wife Annie. Parents Luther Dabney of Virginia & Betty Ann Sharp of Virginia. Emphysema. CLARK, Charles H. - Kingston - Rowe Plot on north end in same space with Gene Clark. CLARK, Gene Rowe. - Kingston - Rowe Plot on north end in same space with Charles Clark. Born in Arizona 2 May 1890 - Died 9 June 1968 Contractor. Wife Myrtle Schulz. Heart Disease. Note: In front of Jonnie D. Howell. COMER, Brenda - Page 1, Plot 26, Sp. B2. Note; East of Foust, South of Perse. COMER, Doug - Page 1, Plot 26, Sp. B1. Note; East of Foust, South of Perse. COMER, Ersie - Page 2, Sec 70, Plot 1. CONNOLLY, Regina - page 2 plot 59. Note: Ty Brandy Marie Walker with mother - DO NOT BURY HERE per Vern Connolly. CONNOLLY, Vern - page 2, sec 56 sp4. Born in England 21 Jan 1854 - Died 28 April 1937 Miner. Parents were George Copson of England & Elizabeth Wilson of England. Arterio Sclerosis. COSTARELLA, Mark Allen Page 1; Plot 12 Spaces 1a, 2a, 3, 4. Note; Permission to be buried there;Mark Allen Costarella #1a; Yolanda Costarella #2a, John Harvey #3, Joseph Brandon Porter #4. Born 9 September 1939 - Doed 22 February 2016. 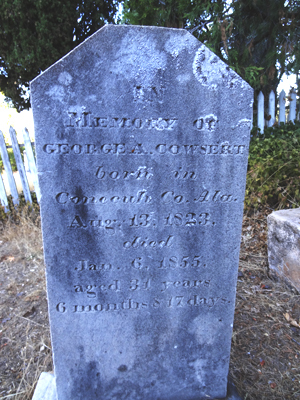 COWSERT, George A. - 57 Tombstone located along the Main road and fence of the Masonic graveyard. 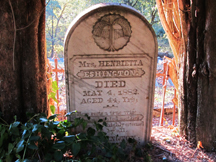 "born in Conecuh Co. Ala. Aug. 13, 1823, died Jan. 6, 1855, aged 31 years 6 months & 17 days." Born in Sheridan, Indiana 2 Dec 1896 - Died 9 Jan 1940 Grocery Clerk. Wife was Kathryn Mary Cox. Parents were Orland Alvin Cox of Indiana & Nelle Stone of Pittsburg. Pancreaittis. CROMPTON, Robert - Page 7, E-6, Nelson Family Plot. Born 1827 - Died 5 June 1857 age 30. Born in Italy 7 Nov 1883 - Died 19 Mar 1961 Wife was Adeline. Laborer Ranching. Parents were TheodoreCurioni & Pauline Gramatica of Italy. Azotemia. DANIEL, Charles W. - page 3, sec 99, plot 3 Note: next to parents. Born in Modesto 4 June 1926 - Died in Peoria, Arizona 16 July 2001 Note: next to parents. DEEM, Russell Emmett - page 6, #20 Veterans plot WWI. Born in West Virginia 30 July 1905 - Died 3 Jan 1966 Woodcutter. Lived at Bennett Ranch. Parents were William Deem & Myrtle James of W. Virginia. Pneumonia. Born 28 April 1944 - 29 July 2013. NOTE: Wrote for Stars and Strips and Misc. papers and magazines in Tuolumne County. Musician. Creator of the music duo DooDoo Wa Band. DENNIS, Fred & Kackie - page 7, D-2 Note: by Wright. born in Germany 1828 Died 11 Jan 1892 age 64 of asthma, found dead in bed. born in Germany 1828 died 3 July 1889 age 61 of malaria. Their resting place. DODGE, Hugh & Jeaanette - Page 7, B5 & B6 . DODGE, Greg - B-5 Note: foot of Hugh. DODGE, Deborah - Page 7, east section B-6 Note: Aunt(?) Florence Powers. DONDERO, Frank C. - Page 5, Sec 260 1904-1966 Note: Dondero, Frank J. - Dondero, Frank C.
Born in Hayward, Ca. 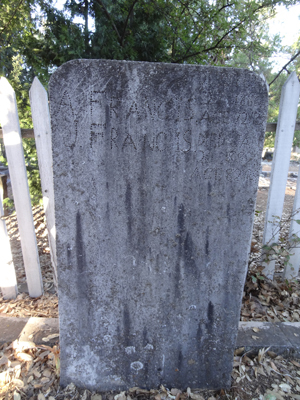 10 March 1877 - Died 8 Feb 1956 Husband Frank John Donderro. Parents Edward Carr of Canada & Mary Ladin of Calif. Coronary Thrombosis. Note: Gorton, Maude M. - Dondero, Jeanette E.
Born on Yankee Hill 12 Oct 1876 - Died 13 May 1970 County Supervisor. Note: Dondero, Jeanette - Dondero, Frank J. Note: Dondero, Frank C. - Dondero, Ruth Note: Ruth Buried in Minn. Jeanette Chierici (Frank's Granddaughter) to be buried in last plot. Daughter of Mrs. Trimbly, Frank's daughter. 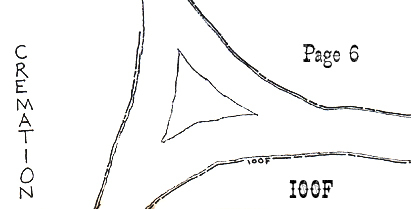 DORE, Isaac S. - Page 6, Plots 7. 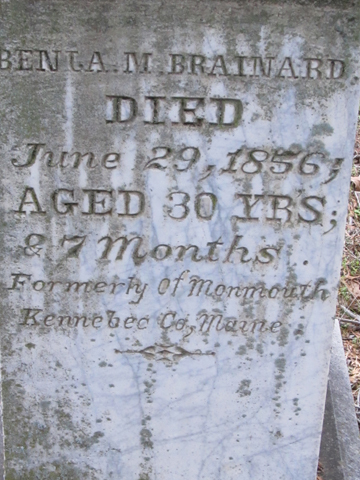 Born 21 Dec 1842 in Harmony, Somerset Co., Maine - Died 26 Jan 1860 age 17 Note: See Details. At the Gravesite all that is left are the four "columns" that once held chains and the foot stone with his initials. Born in France c1873 - Died 17 July 1943 (date of death from C.H. Burden Records) Ditch tender. DUNN, Edna Lee - Page 5, #87 1889-1966 Note: Casket wife of R.L. Dunn Jr. Note: Casket. Edna Dunn & Robert & Dunn Jr.
Born in N.Y. 24 & 1902 - Died 12 Sept 1958 (blood clot on brain) Secretary. Parents were Robert Lee Dunn of Tenn. & Edna E. Pollard of Texas. Born in Calif. 1 May 1895 - Died 17 Dec 1972 Veterans section. Logger. Parents were Charles Dunton of Maine & Rose McAuly of Iowa. Heart failure. Born in Pennsylvania 2 May 1877 - Died 5 Jan 1962 Housewife. Parents were Lewis Carlton & Jesse Lancaster of Pennsylvania. Heart Disease. ELLIOTT, William B. - Died June 15, 1920 age 66. Miner. Born in Calif 22 Aug 1879 - Died 9 Nov 1960 Machinist. Wife was Sarah. 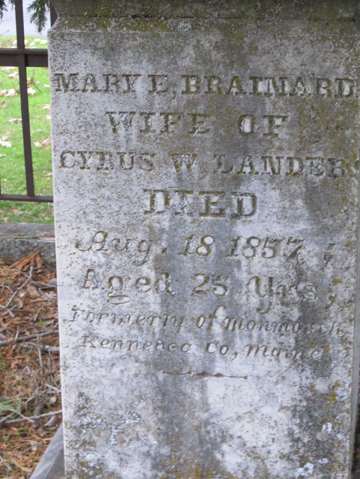 Parents were James Ellis of Kentucky & Evelyn Lanford of Missouri. Killed self with gun. Born in Calif 22 March 1881 - Died 4 Aug 1972 Housewife. 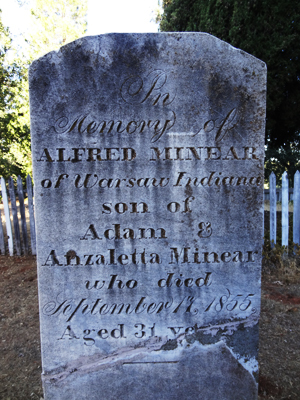 Parents were Adoniram Rand of Maine & Isabelle Smith of California. Heart failure. Note: Fentness, Alvam - Ellis, Sarah E.
Born in Columbia 9 Aug 1889 - Died 18 Jan 1934 Labourer. Parents were Louis A. Engleke of Pennsylvania & Ellen McGowen of Columbia, CA. Fractured skull, accident. Note: West of George Engelke. Born in Philadelphia 13 July 1856 - Died 9 March 1941 Miner. Wife Ellen. Parents Louis Adolphus Engelke of Germany & Melinda Scotworth of England. Intestinal obstruction. Born in Norway 19 May 1893 - Died 28 March 1958 Miner. Heart attack. Note: Charles Bryan and Clara Richard. EUTROPIUS, Johannes - Page 7, C13 East section. Born 1830 - Died 16 July 1866 age 36 Note: Miner died of Typhoid Fever. 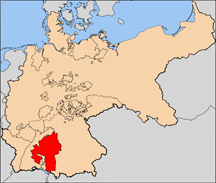 A native of Wurtemberg. Born in So. Dakota 14 Aug 1895 - Died 4 Nov 1970 Supt. Motor Transport. Wife Clara Vick. Parents were Alfred Fairwell & Katherine Marr. Heart attack. Born in Pennsylvania 21 Oct 1897 - Died 14 March 1973 Plasterer. Parents were Joseph Ference of Austria & Julia Kumm of Pennsyvania. Car Accident. FERENCE, Michael Andrew Jr. Veterans Section; Plot 33. Born 11 March 1930 - Died 13 February 2016. Note: Edna in middle top of both plots. FIELDS, George L. - 44 Located along the Main road and fence of the Masonic graveyard. Born in Calif. 22 Dec 1882 - Died 22 Feb 1961 Forman at Marble Quarry. Parents were Guiseppe Filiberti & Angela Muzzi of Italy. Heart attack. FIORE, Kathy (Nijrich) Page 1, Row A, Plot 9 & 10. Born 1 March 1951 - Died 25 August 2014. 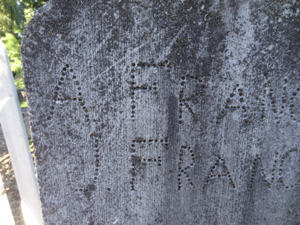 FRANCIS TOMBSTONE The Tombstone is very interesting as it is done with "points" or "dots" that seem to have been punched into the top of the stone in a very amateurish way. The names on the stone are the two that follow. - 62 Located along the Main road and fence of the Masonic graveyard. FRANCIS, A. - 62 Located along the Main road and fence of the Masonic graveyard. FRANCIS, Antonio - 62 Located along the Main road and fence of the Masonic graveyard. FRANCIS, J. - 62 Located along the Main road and fence of the Masonic graveyard. FREE, Mary E. - page ?, Sec ?, plot ? FREE, Meiner H. - page ?, Sec ?, plot ? Note: Sylvia Gardner's cremains are in with the cemetery plot of Hubert Longeway. Born in Canada 7 Dec 1870 - Died 15 July 1945 Miner. Parents were Daniel George of New Hampshire & Jenny Elkins of Vermont. Cerebral hemorage. Note: Morales, Marino - Geirge, Rufus G.
Born in Germany 10 May 1825 - Died 1862 age 37 of complications due to child birth. 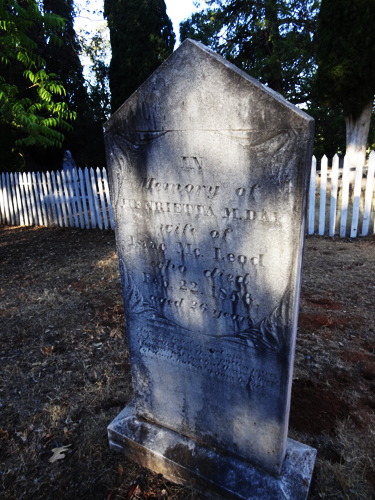 Born in Springfield, CA 11 July 1863 - Died 4 May 1947 84years Husband John Gerber. Parents were Hugh Wilkinson of New Jersey & Eliza WIlliamson of Ireland. Stroke. Born in Missouri 18 Dec 1881 - Died 18 Aoril 1948 Wife Manervia. Parents George Gibson of Tennesee & Dora Kirby of Missouri. Heart failure. 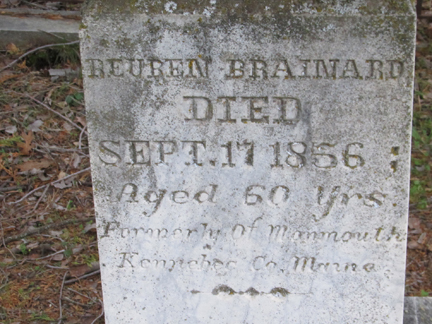 Born in Randolph, New Jersey 1833 - Murdered 26-28 June 1861 age 28. 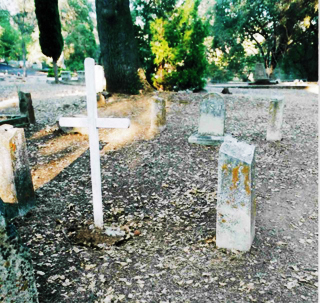 Jacob was murdered while working as an agent for the Tuolumne County Water Company ditches. The 1850 New Jersey census shows Azarias and Sarah Giddis parents to Jacob and 6 other children. Born in Ohio 3 Sept 1886 - Died 25 Nov 1970 Wife Rose Stuart Goodenough. Carpenter. Pneumonia. Parents were William Mullins & Experience Doggett of Nova Scotia. Cerebral hemorrhage. Born in Wisconsin 30 July 1887 - Died 17 Dec 1944 Housewife. Husband Harry Lee Gorton (1887-1972). Mother was Llana Christensen of Norway. Heart. GRAHAM, Daniel Webster - Page 6, Plot 240 Born In Sawmill Flat 25 June 1867 - Died 1 Nov 1941 (record of death from C.H. Burden Undertaker Records 1890-1953) Writer. Parents were Angus Graham & Flora Sinclair of Glasgow, Scotland. Stroke. GRAHAM, Flora Sinclair - Page 6, Plot 240 Born in Islay, Glasgow, Scotland 30 May 1841 - Died 20 Jan 1936 (record states 1832-1926 in C.H. Burden Undertaker Records 1890-1953) Husband Angus Graham. Parents were Donald & Marion Sinclair of Scotland. Myocatrittis. GRAHAM, John - Page 6, Plot 55 Born in Scotland 1849 - Died 12 April 1864 age 15. John was a miner and accidentally shot himself. The 1860 Columbia census shows Daniel & Mary Graham from Scotland with family of 5 children, one of which was John. GRANT, Richie - Page 7 D Note: permission: Richie, Dave, Pat. Born in Calif 18 Jan 1881 - Died 29 Sept 1954 Housewife. Born in Germany 31 Jan 1898 - Died 21 Oct 1947 Housewife. Husband Frank Greier. GREGG, John L. - 55 Plot located along the Main road and fence of the Masonic graveyard. 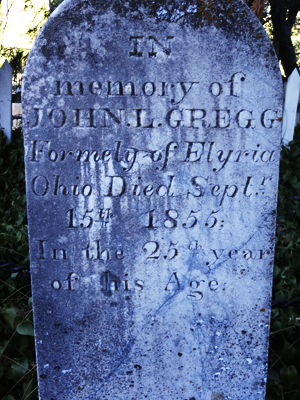 Tombstone states: "Formerly of Elyria, Ohio. Died Sept 15th 1855. In the 25th year of his age." Note; Permission also to be buried; Joseph Haratani, Amy-Ada Haratani, Kathleen Williams. Born in Iowa 8 Nov 1872 - Died 5 Feb 1957 Housewife. Husband George. Born in Calif 4 Feb 1893 - Died 30 April 1965 Rancher. 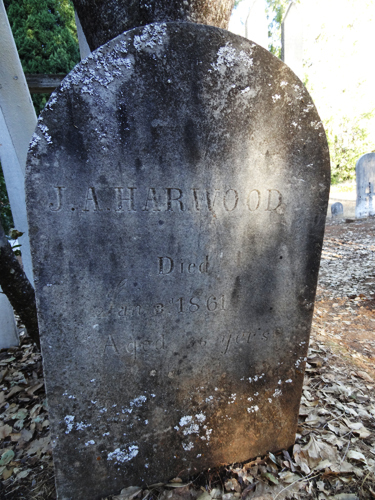 HARWOOD, J.A. 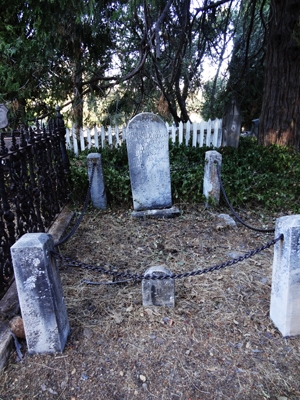 - 61 Tombstone located along the Main road and fence of the Masonic graveyard, states: "Died Jan 3d 1861, Aged 36 years." Born in Calif 29 May 1899 - Died 22 Oct 1973 Cab driver. Wife Grace Van Sant Hawkins. Repeated CVA. Born in Calif 1903 - Died 18 April 1959 Indian. Housewife. Husband Warren Henry. Parents were Ed Plummer & Mattie Berry of California. Heart attack. Born in Santa Barbara 16 Jan 1899 - Died 29 Dec 1948 Machinist. Wife Angelina Hesse. Parents George C. Hesse of Santa Barbara & Miss Fields. Liver. HESSE, Jr. - Page 5, Sec 282 Note: Hesse Jr. - Hesse Jr.
HESSE, Jr. - Page 5, Sec 281 Note: empty 280 - Hesse Jr.
Born in New Jersey 24 Nov 1895 - Died 28 April 1954 Forest service. Wife Effie P. Hill. Coronary thrombosis. HILL, Walter Albert - Pg. 5 plot 24. Born 14 Sept 1894 - Died 23 Dec 1967. Born 9 October 2001 - Died 15 October 2001 (5 days old). Note: located on the G.A.R. book. Born 12 June 1915 - Died 14 May 1991 native of California. Born 24 Feb 1938 - Died 9 Oct 2013. HOLCOMB, Idris Marianne Dunn - Page 5, Sec 88 Born April 1899 - Died 1993 Cremated. HOLLOMAN, Darrell C. - Page 2 Plot 54 sp 3 Born in Wyoming 17 Oct 1922 - Died 21 April 1973. Machinist. Wife Andree A. Maprimo. Parents David C. Holloman of Illinois & Irene Howard of Pennsylvania. Pulmonary edema. Born in Illinois 26 Oct 1879 - Died 26 April 1971. Painter. Parents were Jacob Holloman & Virginia Johnson of Illinois. heart attack. HOLTON, Albert W. - Page 6 Plot 165 Born 1862 - Died of Small Pox 23 Jan 1864 age 2yrs 10mos. Born in Arkansas 24 Feb 1916 - Died 18 Nov 1968 laborer (transient) Heart attack. Note: South of Kelly/Davis (daughter Mary Lousie Howser Born in Sonora 1 July 1940 - Died same day premature. JACKSON, Barbara - Chinese Section B6. JACKSON, George Veterans; Row F; Plot 74A. Note; Permission to be buried there Jackson, Gregory & undetermined. JOHNSON, Daniel A. - Page 6, Plot 22, Note: Also according to stone spire Susan and Richard F. Johnson. 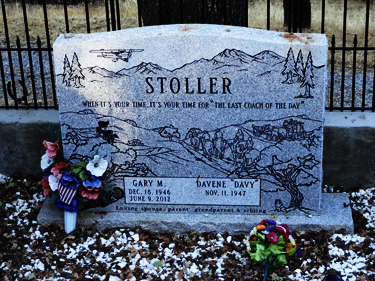 His grave marker. See more. JORGENSEN, Richard E. Sr - Sec.1, F-71 Veteran's Section US Army Captain. Born Sacramento, Calif., 16 October 1945 - (Still pending). KING, I. Doris - Page 5, Sec 210 21 April 1883 - Died 3 April 1971 Housewife. KING, John - Page 5, Sec 211 1875-1968 Note: Doris King - end of Sec. KINGSTON, Arthur - Kingston/Rowe Plot Note: Next to Nellie Kingston on North side. (a different Cemterey card states Edward Kress Born in Calif 17 June 1866 - Died 26 Jan 1909. Laborer. Father was Charles Kress of France. Killed by falling rock). KRESS, Louis Jr. - Page 5, #100 Born 22 Jan 1893 - Died 25 Dec 1964 Cattle & Sheep Rancher. 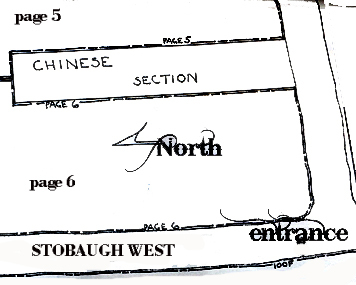 Wife was Ruth C.
Parents were Louis Kress Sr. of California & Tetcia Menzes of Holland. KRESS, Louis Sr. - Page 5, #100 Born in California 12 May 1869 - Died 25 Jan 1954 farming. Wife was Tetcia Menzes Kress. Parents were Charles Kress of Germany & Annie Oregan. Broncho Pneumonia. KRESS, Ruth C. - Page 5, #199 1897-1976 Note: End of Sec. - End of Sec. KRESS, Walter - Page 2, Sec 71, Plots 4 Born in Calif 30 Sept 1900 - Died 26 Oct 1969 Rancher-Cattle & Grain. Wife barbara Shaw Kress. LALLY, Roger Martin - Page 3, Sec 94, Plot 4 Born in Illinois 12 May 1948 - Died 5 Oct 1971 Student. LANE, Roy James - Page 5, #94 Born in Wyoming 18 Nov 1911 - Died 19 May 1959 Architect, Wife Margaret Lane. LANSDON, Alex Brennan - Page 7 Plot 5. His cremations are buried with Boyd, Greg. Another cemetery card states Henry Larson Born in Denmark 18 Nov 1859 - Died 18 Feb 1934. Sawmill watchman. Heart/asthma. Daughter of Patty and Doug Lau. LAUBHAN - page 7, A-16 Note: purchased by Laubhan. Born in Arkansas 17 Nov 1921 - Died 8 Sept 1969 bartender at the National Hotel. Wife Dorothy Pickens Lewis. Parents were Newton Lewis & Meda Holt of Oklahoma. Pneumonia. Born in Oklahoma 2 April 1920 - Died 31 Jan 1973 machinist. Pneumonia. Born in Missouri 4 Feb 1875 - Died 20 March 1949 Farmer. Wife N.A. Long. Parents were Frances Marion Long & Millie Baker. Heart. Born in Calif 3 June 1925 - Died 6 Dec 1971 Housewife. Husband Paul Macias Sr.
Parents were Thornton Lockhart & Nellie Sanders of Ca. Cancer. MAGID, Lorna Jane - Page 3, Sec 118, Plot 2 1924-1972 Notes: "& possibly Diane"
MAGILTON, Forest L. - 63 Located along the Main road and fence of the Masonic graveyard. 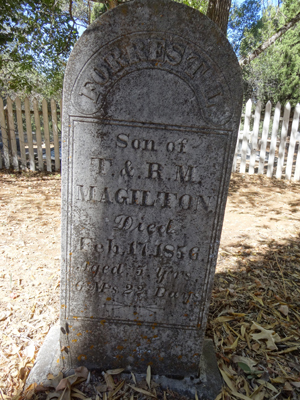 Tombstone states: "Son of T.&. R.M. Magilton. 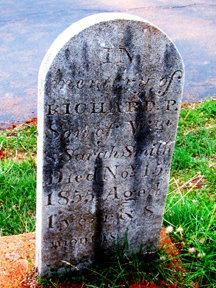 Died Feb. 17, 1856 Aged 5 Y'rs, 6 M's 22 Days." Born in Lowell, Middlesex County, Massachusetts on 26 July 1850 - Died In Columbia. Saleswoman. Husband was Elmer M. 1906-1972. MARBLE, Uretta - Page 5, # 20 Born in Wisconsin 14 Aug 1865 - Died 28 Feb 1945 Housewife. Husband William Marble. Parents were George Marble of Ohio & Nancy Brunson of Penn. Heart. Wife Mary Marble. Parents were William Marble & Uretta of Wisconsin. Stroke. Born in Calaveras Co. 17 Sept 1871 - Died 7 Nov 1950 of Arterio sclerosis. Housewife. Husband George M. Marks. Parents were Kilien Lienk & Mary Anne Mills. Born in Missouri 11 Mar 1870 - Died 9 Jan 1955 Laborer. Parents were James Martin of Missouri & Lucy Lynch of Maryland. Myocardial infartion. Born in Calif. 25 Mar 1885 - Died 13 Sept 1972 Candy Maker. Wife Elaine Pownall Mellor. Parents were William J. Mellor of Illinois & Nellie Ferry of Michigan. Heart attack. Born in Texas 4 April 1879 - Died 5 Nov 1968 Housewife. Parents were Wiley Poe & Cynthia Williams of Kentucky. Anemia. METZ, George Richard - Sec.1, F-70 Veteran's Section. MICHELETTI, Manlio J. - Page 7; A-2. Born in Oregon 5 Nov 1912 - Died 1 Jan 1972 Heavy equip operator. Wife Primitiva Steely. Parents were Thomas Miles of Nevada & Maggie Bell of Calif. Carcinoma toxemia. Born in Calif. 30 Sept 1915 - Died 22 June 1962. Parents were Adam Miller of Maryland & Susie Snyder of Calif. Hypertension. MILLER, Uriah - Page 6, Plot 3 Born in Maine 23 Nov 1802 - Died 26 Oct 1874 age 72 Farmer, Miner. MINEAR, Alfred - 58 Tombstone located along the Main road and fence of the Masonic graveyard, states "In Memory of Alfred Minear of Warsaw Indiana, son of Adam & Anzaletta Minear who died September 17, 1855 Aged 31 Years." MITCHELL, Lillian Frances - Page 3, Sec 104, Plot 2 Born in Colorado 10 July 1881 - Died 15 Dec 1970 Housewife. Parents were Jesse Mulock of New York & Margaret Gribble of Missouri. Heart attack. Born in Mexico 13 Dec 1884 - Died 18 Aug 1960 Rancher. Wife Pauline. Parents were Santiago Morales & Isabelle Diez of Mexico. Heart attack. Born in New York 9 Jan 1854 - Died 30 May 1945 age 91 Farmer. Wife Jane. Born in Vermont 4 April 1904 - Died 7 Dec 1972 Laborer. Wife Amy Fogerty. Parents were Joseph Morriset & Exilia Doyon of Canada. Born in Calif. 25 May 1899 - Died 16 Aug 1969 CSHO Developer Pickering. Wife Leavurn Pinkerton. Parents were Mathew Morrison & Laura Foster of Calif. Emphysima. MORSE, Herman - 67 the Tombstone states: "HERMAN youngest son of Harris & Mary Morse Died Aug 10, 1861 age 1 year." Maybe a victim of a plague? 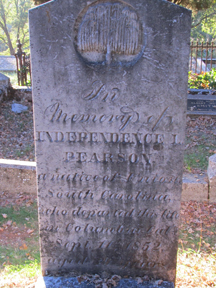 As he is in the row of people who died the same year.Tombstone made by Dealey. MORSE, Mary (Linscott) - 67 Located along the Main road and fence of the Masonic graveyard. Born in Half Moon Bay 7 Oct 1909 - Died 23 March 1966 Housewife. Husband William. Parents were Peter Gianocca of Switzerland & Margaret Reggan of Ireland. Pneumonia. Parents Were William Eugene Muse & Elizabeth of Missouri. McBRIDE, Wes - Page 1 Sec 40 Plot 4. Born in Wisconsin 27 Sept 1900 - Died 24 Dec 1961 Dentist. Wife Geraldine. Parents were Elmer McConnell of Ohio & Ida Brown of Illionois. Heart attack. McHENRY, John T. - Page 5, Sec 204 1916-1993 Note: end of section - McHenry, Patrick A. Jr.
McLOED, Henrietta M. - 60 Tombstone located along the Main road and fence of the Masonic graveyard, states: "In Memory of Henrietta M. Day wife of Isaac Mc. Leod who died Fen 22, 1856 aged 26 years." NOTE: In front of Charles Burlin Staser. Born in Tennesee 6 Nov 1859 - Died 20 May 1950 (record of death from C.H. Burden Undertaker Records 1890-1953) Candy Merchant. Wife Pauline R.
Mother was Christine Russ. Hemorrhage. Note: Naegle, Pauline - Naegle, J.C.
Father born in Tennessee(Ark) and mother in Spain. Note: Listed as a teamster in 1880 census. West of Hutchins. Born in Calif 7 May 1896 - Died 8 Nov 1973 Truck driver. Wife Dois Moran Parents Minert Neilson of unk & Mary Cavey of CA Heart failure. Note: Owner of Nelson's Columbia Candy Kitchen. Note; Owner of Nelson's Columbia Candy Kitchen. 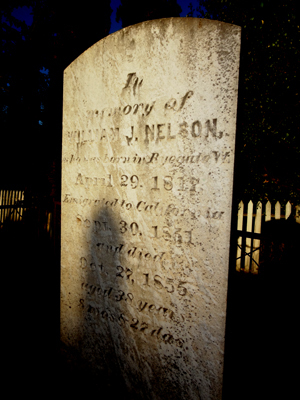 "In memory of Willaim J. Nelson, who was born in Byegale VT April 29, 1817. 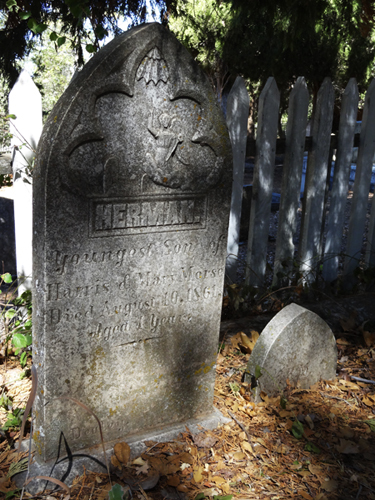 Emigrated to California Sept. 30, 1851 and dies Oct. 27, 1855 aged 38 years 8 mos & 27 da's." NELSON, William James - ? Born in Columbia 24 Sept 1871 - Died 19 Aug 1943. Miner. Parents were Abraham Nelson of Norway & Roslie Kepplemmiller of Austria. Heart. NICHOLAI, Adolph W. - Page 5, Sec 265 1902-1957 Note: Nicolai - Nicolai, Adolph W.
NORTHRUP, Robinson G. Page 6, Plot 4 Born in Rhode Island 1801 - Died 23 April 1873 age 72 Farmer. Born in Oregon 4 Aug 1890 - Died 20 Dec 1969. Nachinist. Born in Colorado 4 May 1900 - Died 5 Sept 1958 Manager, Calif State Dept. Employee. ORR, Florence R. - Page 5, Sec 339 1888-1974 Note: Probasco, Ed - Orr, Florence R.
Born in Calif. 27 Feb 1924 - Died 18 May 1967 Bank teller. Husband Sane Orr. Born in North Carolina 17 April 1885 - Died 28 April 1962 Carpenter. Wife Effie. OTTOLINI, Thamas - Page 5, Sec 190 1899-1964 Note: Ottolini - end of sec. Born in South Dakota 31 July 1900 - Died 15 Sept 1959 Gardener. Wife Mabel A. Owens. Father was William Owens of So. Dakota. heat attack. Parents were Pietra Piazza & Mary Bafico of Italy. Cerebral hemorrhage. PAGANI, Luigi Page 5, Sec 352 Born in Italy 1 Nov 1877 - Died 21 March 1966 Mining & Farming. PAGANI - Kimball, Mevin T. Page 5, Sec 349 1897-1960 Note: Orr - Kimball, Melvin T.
PALMER, Jack Edson - Page 5, Sec 263 Born in Boscobel, Wisconsin 19 Feb 1888 - Died 23 Mar 1940 (death record in C.H. Burden Undertaker Records 1890-1953) Hotel Owner. Wife Mable. Parents were Benjamin Palmer & Lillian Miller of Wisconsin. Pnuemonia. Note: Palmer, Mabel E. - Palmer, Jack E.
PALMER, Mabel E. - Page 5, Sec 262 1896-1971 Note: Dondero, Ruth - Palmer, Mabel E.
PARDINA, Joseph L. - Page 6, Sec 38 Veterans plot Born in Calif. 30 Nov 1914 - Died 1 April 1972 Miner. Parents were Joaquin Pardina & Josephine Tejedor of Spain. Cancer. PERSE, Bob - Page 1, Plot 26, Sp. A2. Note; East of Foust, South of Wittman. PERSE, Nina - Page 1, Plot 26, Sp. A1. Note; East of Foust, South of Wittman. Born in Calif 11 Dec 1929 - Died 23 Aug 1972 Homemaker. Husband John Pesce Jr.
Parents were John Palmer of Wisconsin & Mabel Hazlett of Nevada. Cancer. PETERS, Frank Harrison - 4 plots 2156 Born in Kansas 19 July 1887 - Died 7 Oct 1958 Lumber/Garden. Parents were John H. Peters & Anna M. Braunlin of Ohio. Skull fracture; fell off ladder. Born in Sonora 24 June 1887 - Died 21 June 1954 age 67 Hardware merchant. Wife Kate M. Peters. Parents were Harry Peters of Calif & Margaret McCann of Mass. Myocardittis. NOTE: Family told me that she was half Chinese. Born in Utah 28 July 1892 - Died 8 Dec 1968 Postmaster. Parents were Peter Peterson of denmark & Emma Rasmussen of Utah. Pnuemonia. NOTE: US Navy, M2, WWII. Born in South Dakota 11 Nov 1899 - Died 10 Mar 1958 Nurses aide. Born in Calif 31 July 1902 - Died 11 Dec 1967 Housewife. Husband Clyde E. Phillips. Parents were Henry Roeder of Calif & Sophie Maag of Nevada. Heart attack. Born 20 July 1939 - Died 30 December 2014. Cremated. Born in Calif 11 Feb 1877 - Died 11 May 1958 age 81Forester. parents were William Phillipson of England & Rachel A Powell of (unknown). Stroke. Born in California 15 April 1895 - Died 7 Dec 1966 maintenance man, WWI Vet USNRF. Parents were Frank Pierce & Mary O'Donnell of Calif. Heart attack. PITTS, Sylvanus W. Page 6, Plot 57 Born in Skowhegan, Maine 1822 - Died 16 Jan 1895 of Asthma age 73. Arrived in Columbia c1852. Wife was Louisa Wyman Pitts. PLUMMER, John - Page 5, Sec 170 Born in Calif 15 Oct 1911 - Died 4 July 1966 Indian(Mi-Wuk). Laborer. Parents were Edward Plummer a Mi-Wuk & Mattie Jackson a Mi-Wuk of Calif. Stroke due to Diabetes. Born in Calif 30 Mar 1914 - Died 14 Dec 1964 Indian (a Mi-Wuk) Timber faller. WWII Vet. Parents Ed Plummer & Mattie Jackson (both Mi-Wuk Indians) Cancer . Born in Calif. 25 Dec 1896 - Died 15 July 1972 Ranch hand. Living on Green St.
Parents were Edward Plummer & Mattie Jackson (both Mi-Wuk Indians) Heart failure. Born in Calif 19 June 1937 - Died 2 June 1973 Heavy equip. operator. Wife Carolyn Lewis. Parents were John A. Podesta & Julia Quierolo of Calif. Cancer. parents were Nicomedes Ponce & Sinforosco Arrias of Chili. Blood clot in lung. Born in Penn 21 Feb 1881 - Died 18 jan 1963 Lumberjack. Parents were Joe Pool & Mary Bastrow of Pennsylvania. Heart attack. Born in Kansas 5 Jan 1885 - Died 10 Jan 1962 Miner. Parents were John Pwel & Charlotte Jones of Illinois. Pnuemonia. PRIVETT, Roger - Chinese section D9. Born 7 October 1940 - Died 3 January 2013. Note; Cremains Intured with Mother Irma Bukovich. Born in Ohio 3 June 1869 - Died 2 Sept 1957 oil engineer. Parents were Jackson Probasco of Pennsylvania & Sarah Smithey of Ohio. Heart attack. QUEROLO, Vivian - Page 5, Sec 202 Born in Calif 4 April 1901 - Died 24 May 1959 Housewife. Husband Domingo Queirolo. Born in Oklahoma 22 April 1879 - Died 26 Sept 1957 Housewife. Born in Joplin, Missouri 27 Oct 1889 - Died 21 April 1955 Laborer. Parents were Charlie Red of Wisconsin & Lizzie Pruett of Missouri. Myocardial infarc. Born in London, Kentucky 28 Feb 1878 - Died 28 July 1946 Rail roader. Wife Jennie. Father Austin Reid. Heart attack. Note: Reid, Jennie Eliza - Reid, Austin T.
Born in Germany 27 Dec 1899 - Died 17 Dec 1970 Housewife. Husband Franz Reinke. Parents were Julius Lang & Emma Kuhl of Germany. Heart falure. Born in Utica, New York 30 Oct 1883 - Died 14 Nov 1948 Husband Charles Guy Rickard. Father was Thomas Williams of New York. Hemorrhage. Born in Mississippi 25 Nov 1924 - Died 14 Nov 1961 Truck driver. WWii vet. Parents were Belford Duncan of Louisiana & Mary Hudson of Mississippi. Auto accident - bled to death. ROBLES, Tim - Page 1, Plot 40, Sp. A3. Note; South of Foster. Permission to be buried there from Gordon Boone. Born in Norway 24 June 1883 - Died 22 Aug 1944 Painter & paperhanger. Parents were Roen Roesen & oli Olvson of Norway. Cerebral hemorrhage. Born in Illinois 21 May 1866 - Died 17 Jan 1942 Farmer. Wife Louella. Parents were E.D. Rountree of Illinois & Mary E. Friend. Heart. Born in Copperopolis 12 June 1885 - Died 19 Aug 1942 age 57 Mine operator & manager. Wife Nellie Grace Rowe. Parents were Philip Rowe of Cornwall & Carrie Campbell of Copperopolis. Heart. RUPERT, Mary Pensa - Note: In Pensa Plot West of Main Road. 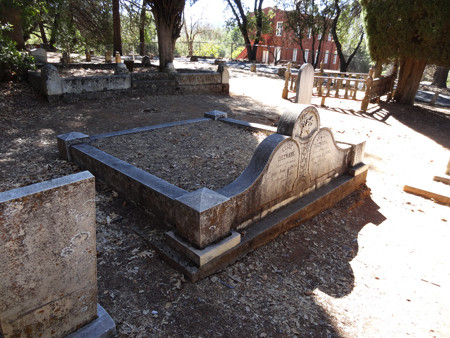 Parents were Morris R. Ryan of Placerville & Pearl Totten of San Pedro. Pneumonia. 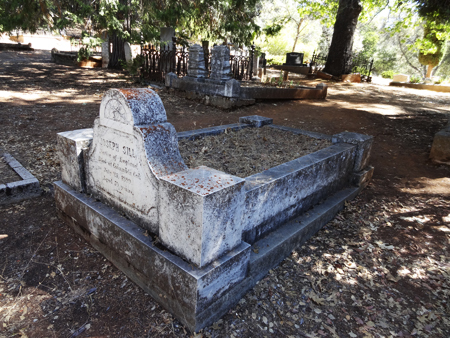 Born in Mukelumne Hill 27 Aept 1887 - 23 Oct 1946 Gold miner. Wife Lucille Ryan. Father was Richard Ryan. Heart attack. Born in Knights Ferry 16 July 1861 - Died 13 Sept 1947 Housewife. Husband John Schider. Parents were William Gabel & Mariw Wesselhoft of Germany. Coronary Occlusion. SCHREIBER, Edward H. - Page 6, sec. 21 Veterans Plot. WWi vet. Born in Pennsylvaania 17 Jan 1889 - Died 13 July 1966 Miner. Parents were William Schreiber & Miss Ross of Germany. Lung cancer. Parents were Samuel F. Scott & Mary ellen Chisnon? of Calif. Heart attack. Born 16 March 1927 � Died 25 Feb 2016. Parents were Edward Shaver & Martha Smith of Illinois. Heart attack. Born in Russia 27 Dec 1885 - Died 12 May 1961 Photographer. Wife was Mildred. Parents were Alexander Shoob & Sarah Kransky of Russia. Heart attack. Born in England 1830 - Died 25 July 1889 age 59, Miner. 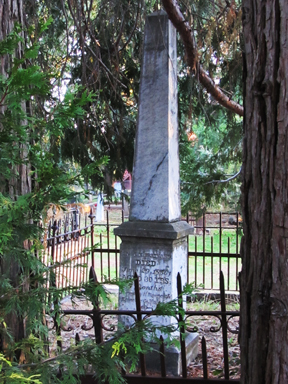 Tombstone states: "Native of England, Died at Columbia, Cal. July 25 1889. Aged 59 years." Born in Nova Scotia 22 Jan 1901 - Died in Sonora 30 Aug 1971 Clerk. Wife Eileen Parks. Parents were Joseph Simpson & Dorothy Campbell of Canada. Heart attack. 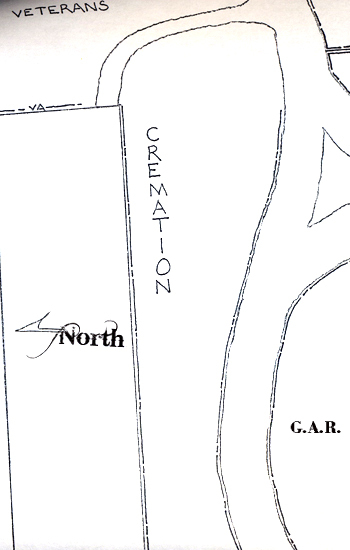 SKEWS John Warden (Preacher John) - Marker in Cremains Section Row P, Sp. 7. Born 18 Sept 1948 - Died 2 Dec 2008. SMART, Bennie - Page 7 D-5 Note: Hans J. Salao. Cremains at head. SMITH, Charles James - Pg. 5 Plot 43. Parents were Charles William MacDonald of Cunberiana, Indiana & Sarah Catherine Pugh of West virginia. Heart attack. Born 4 July 1915 - Died 24 Feb 1970 Bookkeeper. Wife Ann Porovich. Parents were Robert H. Smith of Michigan & Fnny Gordon of Oregon. Pneumonia. Born in Nebraska 5 Nov 1914 - Died 7 June 1967 Mine tour operator CSHP. WWii vet. Parents were William Smothers of Nebraska & Elizabeth McConnell of Iowa. Car accident. Born in Honolulu, Territory of Hawaii 10 Feb 1892 - Died 13 Dec 1949 Tavern owner. Wife Ruby. Pneumonia. Born in New York 20 Dec 1882 - Died 19 Jan 1955 Carpenter. Wife Lora. Parents were Frank Spencer of Ohio & Clara Snow of New York. Prostate cancer. Note: Rountree, Luella - Spencer, George. Parents were Nichols Sperry of Russia & Eve Peterson of Germany. Stroke. Note: Souza, Victor Murray - Sperry, Frank J. Born in Holland 17 June 1913 - Died 30 May 1955 not married. Ag engineer. Parents were Rynier Spitzen & Cornelia Fleer of Holland. STARBIRD, Abbie - 45 Located along the Main road and fence of the Masonic graveyard. Born in Calif 23 March 1927 - Died 15 June 1957 Army Sgt. Single. Parents were William Staser & Martha Shields of Calif. Car accident. Born in Ohio 7 Oct 1898 - Died 2 Dec 1968 Train Mechanic. Parents were Alfred Steele & Sarah Wilkinson of Ohio. heart attack. Born 4 August 1932 - Died 18 Feb 2007. SSG US Army Korea. Note: Ashes in "triangle" at Oddfellows Way & Stobaugh West. Born in Texas 6 Jan 1906 - 16 Sept 1954 Housewife. Seperated. Parents were N.H. Powers of Texas & Laura Lee Nix of Kentucky. Myocardial infarct/pneumonia. Note: empty - Striplin, Nora B. Parents were Walter Sundborg of Alaska & Nadine Kelley of California. Heart failure. Note: Adaline Allen (wife to Walter) buried on top of him. Born in Kansas 24 Aug 1871 - Died 23 Sept 1939 Plasterer Wife Augustine Sutton. parents were William Sutton of Indiana & Hermentha Dtyers of Ohio. Stroke. S.W. - Page 1, Plot 86 Note: Scribed footstone. Belongs in "W"
SWEELEY, Bobby Cheel - Page 5, Sec 302 1923-1973 Note: Sweeley, Frank M. - Sweeley, Bobby C.
Born in Ohio 5 Mar 1889 - Died 19 Jan 1971 USFS. Wife Helen Pleasants. Parents were Philip E. Sweeley & Martha Wright of Pennsylvania. Cardiac arrest. Note: Sweeley - Sweeley, Frank M.
Born in Tuttletown 27 Dec 1868 - Died 9(15) Feb 1948 Goldminer. Wife Phoebe. Parents were William Swerer of Pennsylvania & Elizabeth Whittle of England. Pneumonia. Note: Hall, Raymond - Swerer, Cassiius M.
Parents were Cassius Swerer & Fabia Lindsey of Calif. Heart failure. parents were Robert Lindsey & Connie Phister of Calif. Note: Swerer, Clarence - Swerer, Pheba J. Born in California 9 Jan 1886 - Died 10 June 1970 Housewife. Father was James Burns. Heart disease. Parents were Lars Seastrand & Anna Sangren of Sweden. Coronary Thrombosis. Born in halstead, Kansas 26 April 1876 - Died 6 Oct 1935 age 59 Miner. Born in Kansas 20 Mar 1874 - Died 10 July 1941 Miner. Wife Marie Tarbet. Parents were Hugh S. Tarbet of Scotland & Louisian Ellen Akins of Halstead, Kansas. Apoplexy. 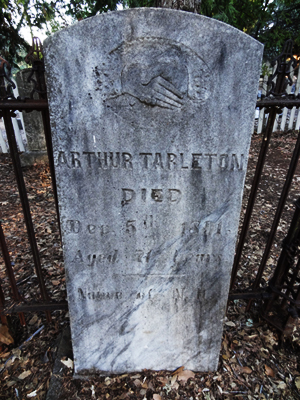 TARLETON, Arthur - 64 Tombstone located along the Main road and fence of the Masonic graveyard. 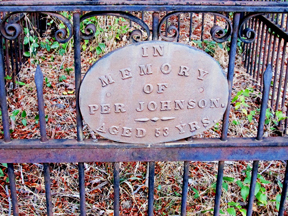 Died Dec 5th 1891 Aged 71 Years. Native of N.H.
Father was Thomas Taylor of Texas. Born in Calif 24 Sept 1889 - Died 18 Jan 1973 Bookkeeper. Parents were William W. Hill of Maine & Sarah Mildred Hanson of Kansas. Pneumonia. Born in Austria 12 Feb 1880 - Died 18 Oct 1972 Carpenter. Wife Lavonia Hill. Parents were Mato Terzich of Austria & Christnia ? of ? Pneumonia. West of Campbell & Taplan. She was a singer in "The Morman Tabernacle Choir". Native of Tuolumne County. Proud desendant of Cornish & Italian Pioneers. Born in Nevada 23 April 1906 - Died 21 June 1972 Housewife. Parents were William Rule of Calif & Lillian Mullock of Colorado. Multiple myeolma. Born in Calif 16 April 1885 - Died 16 Sept 1968 age 83 Husband Robert H.
Parents were Epolite Van Dewerdt & Mariea N. Marsh. Born 5 April 1859 in Holland - Died 12 August 1941 Housewife. Husband Henery. Father was Jacob Menzes of Holland. Heart. Born in Calif 6 Dec 1912 - Died 16 Aug 1959 laborer. Wife Mary Van Winkle. Car accident. Note; Buried with husband Robert Van Winkle. Parents were William Vargus & Emilia Roscha of Azores. Intestinal hemorrhage. Note: Al & Hilda O'Conner - end of sec. W., S. - Page 1, Plot 86 Note: Scribed footstone. No Head stone. WALLACE, John & Charlene & Susan - page 1 Note: west of "Graves" next to fence. WATSON, Toby & Warren - Page 1 Veterans section Note: on the tree line. South of Bowling. 2 plots. See card file. Parents were Henry Wetmore & Mary Winn of Connecticutt Heart failure. Note: purchased 11/57. WIlson, Amy C. & Francis. Also Dorie Lillian Wilson Born 10 Oct 1925 - Died 25 Feb 2014 and Raddeck William Wilson Born 2 Aug 1924 - Died 12 Jan 2012 are scattered over this grave. Born in England 29 Feb 1880 - Died 16 Sept 1962 Machinist. British Vet WWi. Born 19 September 1937 - Died in Columbia 18 August 2015. Note: Concession contract with Columbia State Historic Park (and Wife Leslie) Columbia Gazette Office, Eblers Leather shop and The photo Studio. Note: Concession contract with Columbia State Historic Park (and Husband Harry) Columbia Gazette Office, Eblers Leather shop and The photo Studio. NOTE: Daughter said, Dad's "ashes were scattered over the Sierra's"
Born 23 Oct. 1913 - 15 Feb. 2008. WYNNE, Roselynne - Page 1, sp 35, Plot ? NOTE: Most of the records came from a card index filed with the Columbia Cemetery District. Some details were found in the C.H. Burden Undertaker Records 1890-1953, where noted. Other sources are named on the individual listings.